Haven’t made a fondant cake in awhile, Courtney has been so busy with her promotion to manager at work and I haven’t been brave enough to tackle any on my own but when my friend Heather texted and asked for this one, I thought I could probably to it on my own. I found the tshirt cake pan at Michaels which made this a whole lot easier. The cake is just a chocolate cake mix with an extra egg and a small box of chocolate pudding added in, the frosting is our standby Buttercream icing and the fondant is Wilton, also from Michaels. 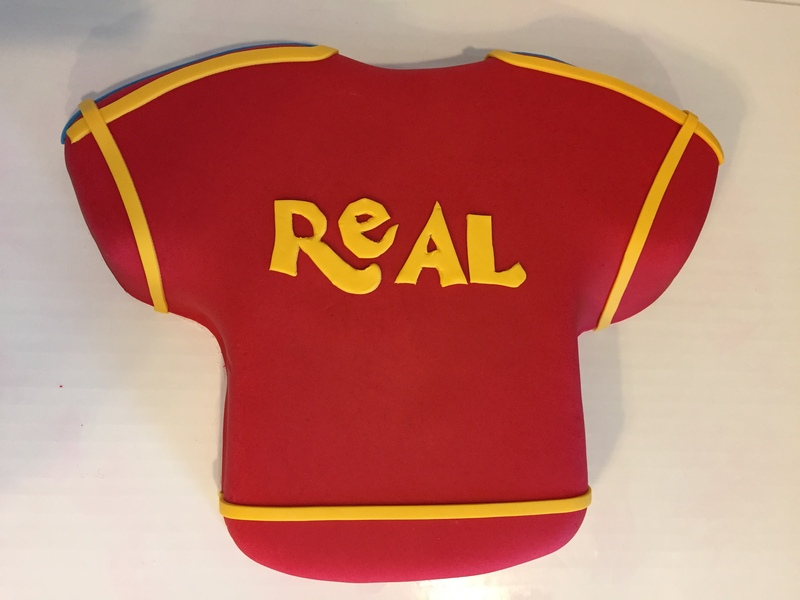 It came out pretty good although I did have trouble cutting out the Real logo, the fondant was so gooey! Heather reported back that her friend Damon loved the cake and that it was the best fondant cake they had ever tasted so success! !